The Indian aviation space has been full of doom and gloom in the last few days. To start with, let’s look at the position of the balance sheet as at 30 September of all three listed aviation companies. Kingfisher Airlines Ltd’s loan funds stand at Rs7,543 crore (debt-to-equity ratio of about 3.2) and that of Jet Airways (India) Ltd’s is Rs14,123 crore (debt-to-equity about 4.2). Spicejet Ltd, on the other hand, has the lowest debt at Rs712 crore (debt-to-equity about 0.7). Of course, SpiceJet’s scale of operations, going by revenue, is much lower than the other two. For instance, SpiceJet’s revenue for the quarter ending September is 23% of Jet’s revenue during the same period. On comparing the asset base of the three, Jet Airways seems to have the strongest balance sheet. Kingfisher’s fixed assets stand at Rs2,286 crore, but it has a negative net working capital (excluding cash and bank balance) of Rs1,970 crore. Jet Airways has a much stronger asset base with the value of its fixed assets at Rs14,417 crore; its negative net working capital (excluding cash and bank balances) is relatively much lower at Rs560 crore. ?SpiceJet?has?a?total fixed asset base of Rs1,115 crore. 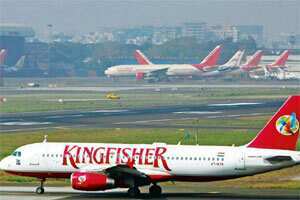 India’s aviation industry is nose diving, with Kingfisher Airlines leading from the front. Mint’s Pallavi Pengonda shows us how a few numbers tell the story of their troubles. However, the more important question is what went so terribly wrong with Kingfisher when rival Jet Airways has comparatively much higher debt as well as higher loss in its books for the quarter ended September? Kingfisher could not deliver on profitability even last year when?the?going?was?considered to be good. According to analysts, the sector experienced its best returns in the quarter ended December 2010. Even during such times, Kingfisher’s net loss for fiscal 2011 stood at Rs1,027 crore. That’s when Jet had managed a net profit of Rs9.69 crore—on a stand-alone basis—and SpiceJet posted a net profit of Rs101 crore. SpiceJet’s net profitability, of course, was also supported by relatively lower interest expenses. For the September quarter, Kingfisher’s operating losses are higher than the other two, with Jet’s operating loss being far lower. Kingfisher’s fuel and interest expense (Kingfisher’s debt is also probably costlier than that of Jet Airways) as a percentage of revenue is higher than that of Jet. Higher interest costs, coupled with higher operating losses, has led to pressure on Kingfisher’s ability to service its interest and debt obligations. Further, Kingfisher’s current liabilities have increased by 23% in September from March (an indication that it may be stretching payments to suppliers). Naturally, Kingfisher seems to be the worst affected of all the three. As of now, Jet Airways and SpiceJet are likely to reap some benefit out of Kingfisher’s plight. Having said that, higher fuel prices and a weak rupee remain a concern for the sector in the near future. All the three firms posted net losses for the half year-ending September, including SpiceJet, the most profitable listed airline last year.